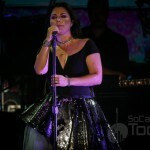 One of the most unique tours of 2018 made a stop in Irvine on Saturday night September 1 at Fivepoint Amphitheater as Evanescence along with violinist Lindsey Stirling both backed by a full orchestra brought their talents to the stage. Opening the show was the Cello/percussionist duo known as Cellogram who put on a short but entertaining set that included covers by Queen and Led Zeppelin. With fans still funneling in during their stage time, they did a wonderful job of creating a mood for the rareness that was to come on this night. Violinist, dancer, performance extraordinaire, and composer Lindsey Stirling took the stage and dazzled the Fivepoint Amphitheater for 75 minutes with not just a concert but a magical journey featuring dancing, set changes, costume changes and lots of violin. The ultra-flexible performer opened the show with “The Arena” before tombstones and skeleton dressed dancers appeared for “Moon Trance”. Stirling addressed the crowd early and thanked them for coming and stated how great it felt to be in the cool, dry California weather after touring through states that were scorching hot. 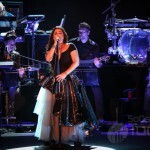 Early in the show Amy Lee from Evanescence joined Stirling on stage for “Shatter Me” for an amazing performance after which Stirling could not praise Amy Lee enough stating she has been a huge fan of hers for many years. Stirling continued to “WOW” the crowd with her performance as she was constantly dancing, bending and leaping across the stage all while continuing to play the violin – simply amazing! 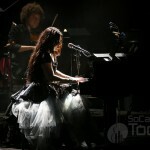 Stirling played many hits from her catalog and ended the night with a medley from Phantom of the Opera. 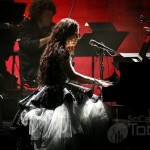 Oh and during the entire performance she and her dancers were backed by a full orchestra. This wasn’t the last we would see of Lindsey Stirling on this night. 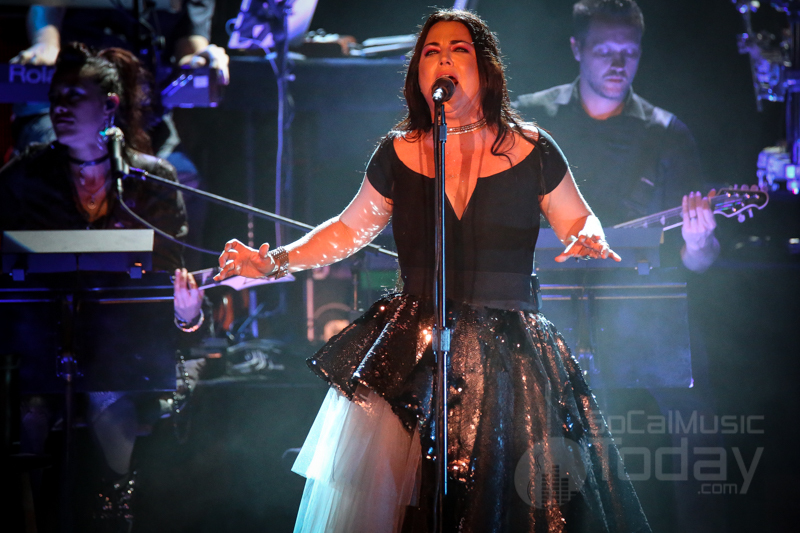 With the release of Synthesis in late 2017, Evanescence reworked some of their greatest hits backed with a full orchestra resulting in a fresh new take on some already amazing material which no doubt led to this tour. 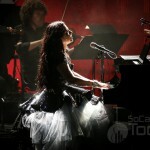 The night kicked off with Amy Lee taking a seat on the piano and the band and orchestra went into “Overture” and “Never Go Back”. 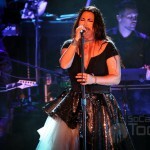 Right from the first vocal note, it was obvious Amy Lee’s voice is as strong, powerful and beautiful as ever. 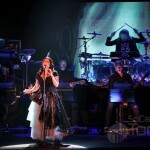 With band members Troy McLawhorn and Jen Majura on guitars, Tim McCord on bass and longtime drummer Will Hunt, the band sounded tight and spot on with the mystical sounds of the orchestra behind them. 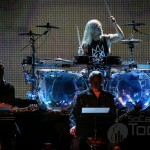 The songs sounded as commanding as ever with the live orchestra adding that extra element making for a powerful delivery. 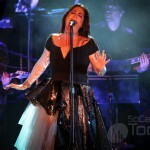 In addition to the songs from Synthesis, the band played a cover of the Beatles “Across the Universe” as an added bonus. To no surprise Lindsey Stirling made an appearance during the song “Hi-Lo” (she plays on the record as well) adding her violin skills to the live set. Between the beautiful vocals of Lee and the movements and playing from Stirling – this was without a doubt the highlight of the entire night. 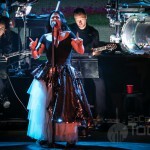 After the band finished the night with “Imperfection”, they returned to the stage and again Lindsey Stirling appeared as they collaboratively played an amazing cover of Ozzy Osbournes “No More Tears” and Sia’s “Alive”. What a way to end an epic night of not just music but an experience both from an audio and visual perspective. 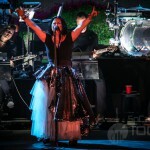 The idea of Evanescence and Lindsey Stirling touring together was simply brilliant and all in attendance left the show fully satisfied but wanting more.